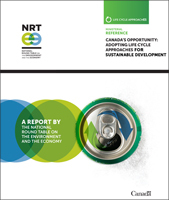 The NRT is pleased to present Canada’s Opportunity: Adopting Life Cycle Approaches for Sustainable Development. 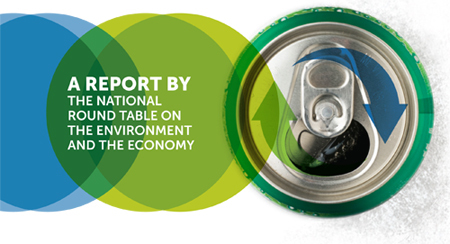 This report, prepared at the request of the Minister of the Environment, identifies the need for Life Cycle Approaches in considering the economic and environmental sustainability of Canadian products and policies. Canada’s Opportunity provides an overview of Life Cycle Approaches in use in Canada and elsewhere, the risks and opportunities related to their uptake, the conditions for their successful adoption in the private and public sectors, and identifies actions that the government can take to support their application. It sets out the risks faced by Canadian companies that are unprepared for or unable to comply easily or quickly with existing or anticipated foreign government regulations that require product life cycle disclosure. It also identifies opportunities for companies that adopt a Life Cycle Approach to achieve better supply-chain performance, internal operation efficiencies, and increased institutional capacity to enhance innovation and support environmental stewardship. Using resources efficiently — from extraction to disposal — is no longer a simple matter of local decisions; it is increasingly a matter of global importance. The NRT believes there is a clear economic imperative for adopting Life Cycle Approaches to address growing market-access issues for Canadian goods and commodities. Life Cycle Approaches to sustainable development are here to stay. While their full application remains a “work in progress”, the trend is clear. Knowledge and expertise is growing in this field and Canada must get on top of it. – What are life cycle approaches? – Why are they needed? – Examples of life cycle approaches? We need public policies that facilitate increased information sharing about the benefits of Life Cycle Approaches, provide guidance on best practices, and increase collaboration in data gathering, and analysis.